what's up at Sten Hostfalt's New York City Guitar Studio. Right now after thirteen years as part of Sten Hostfalt's sole proprietorship registered New York City music production and music education services business Sonus Rex, 25 years since the initial innovative contribution to the New York scene, 30 years since first appearing on the U.S. East Coast scene, we all in all celebrate 4 decades in creative music internationally. In the process, generating and producing nine official audio releases, enthusiastically featured and documented by international press and media. And hundreds of live concert performances alongside some of today's most innovative musicians, composers, perfoming dance artists, recording engineers and producers. As well as hundreds of people of all ages, levels and styles taught. Including students enrolled at, or teachers of premier academic institutions. Numerous students coached successfully admitted to prestigious music schools and performig arts programs. Once again Thanks to everyone-teachers, mentors, colleagues, friends and above all - all of the students continuously involved in the creative process for their truly imaginative input, which is what really makes it all possible. SEE YOU IN SESSION ! At this point in time for reasons that will be discussed a bit further down in this text, the bulk of the teaching and general session activity both for Sten's Guitar Studio and as an educational services provider for New York Jazz Academy takes place by Rockefeller Center/Times Square ( where things in a way in fact started already 25 years ago, in 1994 ) and overall there is an incredible amount of astonishing work in progress as we speak. 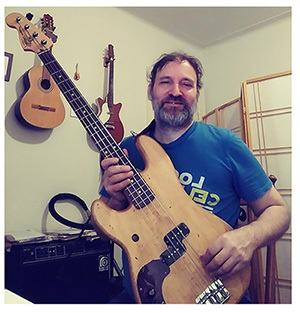 New NY Jazz Academy student Pablo, who already is is a very capable player in the progressive rock idiom and now commits to a deeper study of the Jazz tradition, is a great new energetic addition to the student roster. Lots of creative input, energy and a great learning attitude overall. We've worked together for a couple of months now and are as we speak in the middle of a project study of Charlie Parker's be-bop classic Confirmation, involving learning how to comp the changes in all inversions on all string sets, and harmonically and rhythmically analyzing, as well as interpreting and finding idiomatic fingerings for Bird's phrasing of the famous head. My longtime student Jennifer, who now is on her ninth year as a student with me ( since 2011 ), and thereby definitely holds a record of some sort-although I still am to figure out what to call it, since she's the one and only of her kind. Never seen anything like it. Fingerstyle inclined from the get-go she has by now impressively been through the entire Mississippi John Hurt repertoire, much of John Fahey's iconic fingerstyle folk Americana work, and a lot of the less charted material by all American legendary folk music icon Bob Dylan. As well as a good deal of the standard introductory classical guitar repertoire. As we speak we have just concluded a project with the Bourree from J.S. Bach's Cello Suite no.3 BWV 1009. And now look at Gavotte en Rondeau from Bach's 4th Lute Suite in E major BWV 1006a. Meanwhile Giselle, currently enrolled at Brown Unversity and a student with me via New York Jazz Academy, is a classical pianist, expanding her palette by getting aquainted with the guitar and Jazz music. Her outlook represents a fresh, simultaneously both traditional and modern approach. Fresh out of the gate to meet the new year the first month of 2019 is already very busy, with as we speak very few slots still unclaimed. New York Jazz Academy sessions are on Saturdays Jan 19+26. Right now, Tuesdays (Jan 15 and 29 btw 3-8pm), and Saturdays (mainly Sat Jan 26, though 6-8pm hits on Sat Jan 19 and 26 are possible as well ) are the only openings for the time being. I would like to accommodate and fit everyone, so by all means please do consult the calendar for currently open days/times before e-mailing about session requests. 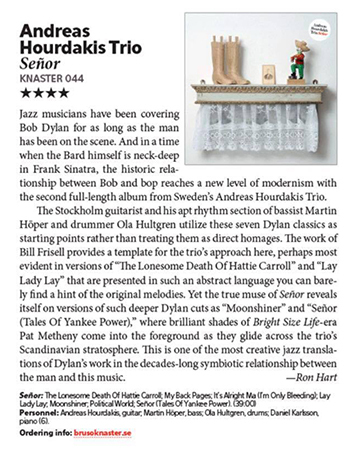 This months Proud Teacher Announcement is about Sten Hostfalt's former KMH Royal College of Music in Stockholm student, Andreas Hourdakis' ( who in all honesty pretty much had his playing already figured out when we met ) and whose second album as a leader 'Señor' was featured on the list of the world's leading Jazz publication Down Beat Magazine's top rated albums of 2018. We congratulate Andreas and his Trio and everyone involved in the process-looking forward to be following next phase of Andreas' great work. The Sonus Rex label presents Sten Hostfalt/Johnny Lapio Out February 1 and Sten Hostfalt / Four Pieces For Microtonal Guitar / Transformations Due for official release March 1 BOTH AVAILABLE for PRE-ORDER NOW ! 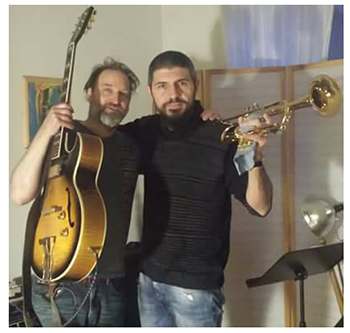 Sten Hostfalt / Johnny Lapio is a March 2018 recording documenting Sten Hostfalt's ongoing collaboration with celebrated Italian Avantgarde trumpet player Johnny Lapio, whose credentials notably include collaborations with major names in modern improvised music like Anthony Braxton, Taylor Ho Bynum, Mary Halvorsen, Markus Stockhausen and Sylvano Bussotti. 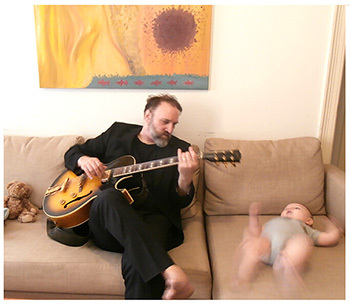 Sten Hostfalt / Four Pieces For Microtonal Guitar / Transformations contains the commissioned original microtonal music composed for the Nov 21, 2014 world premiere solo concert performance at XXXV Encontres de Compositors staged at Pilar i Joan Miro in Palma de Mallorca, Spain. The pre-order purchase, via Bandcamp enables instant download of the three featured tracks from each album, and both entire albums for download on the official release date. All proceeds guaranteed straight to the artist and to financing of promotion and distribution of the recordings. Towards 2019. Guitar Ensemble and More. Transition times here at the studio. While many old longtime regulars keep returning for years-like all-time ukulele champ William ( pictured below as one half of The Flaming Ukes - and a key contributor to this organizations increasingly sophisticated, growing Ukulele repertoire ) who is based in Bordeaux France, and visits NYC every 6 months. By the same token, as some old regulars move on-new ones come in. Like new Jazz Guitar aquintance WES who hit me up about READING music, a truly great continuous project always, as MUSICAL LITERACY is key to many resonating things in music, and as such incredibly important. Among other NEWS, group playing and performance opportunities will be offered in the near future, simply as a part of the program. In the works is a regular GUITAR ENSEMBLE in which anyone can participate ! All regular private students may do so, as a part of their regular study program and without additional fee. While old, former students, as well as prospective, students ONLY interested in participating in the guitar ensemble ( without also studying with me, privately ) may do so at the cost of either a seasonal, or short term 'project' sign-up fee. The initial idea is simply for us all to hold sessions and play a concert to display, show and manifest our work. The repertoire is thought to relate to work in progress, as well as include older works by students, by artists or others. Instruments ( along with any type of guitar ) can include mandolin, ukulele and acoustic and/or electric bass guitar. If you are interested in playing in a guitar ensemble, where we will be reading, composing, arranging, improvising, interacting, exchanging and discovering music - check out the info here on how to sign up. On another note VIRTUAL SESSIONS via Skype has really impressed me lately, with it's greatly improved connection stability. To the point where I'm now a devoted fan ( though previously not so much ) of and believer in virtual sessions. While real live interaction of course by far will always be best-no contest, virtual sessions are getting so good these days if you ask me, they're definitely good enough to consider. The October schedule is now posted right here. In general this month there is a fair amount of select ( certain days and times ) openings at both Manhattan locations ( Times Square and Lower East Side ) and in the somewhat more budgeted studio in Ridgewood Queens. As well as for virtual online sessions via Skype. Just get in touch ASAP about the dates and times you are interested in and we'll set it up accordingly. We would first of all like to congratulate the youngest member of our music club, Ocean on his first birthday in this world, Friday Sept 28th. Here is an action photo from one of our sessions a few months back. Somewhat older, but still indeed young is our very talented Jazz guitar friend Corazon Szell who studied Jazz guitar with me through New York Jazz Academy during the spring semester, on top of her regular studies at New York's legendary LaGuardia High School For Music & Performing Arts ( AKA the 'Fame" school ). 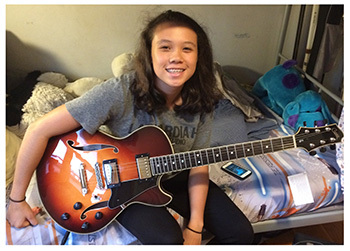 We recently had the honor and pleasure to refer Cora to NYC"s #1 Jazz guitar store, Rudy's Guitars in Soho where she got a nice guitar designed by famous PA luthier Bill Comins. A great match indeed. We can't wait to hear more of Cora's music. 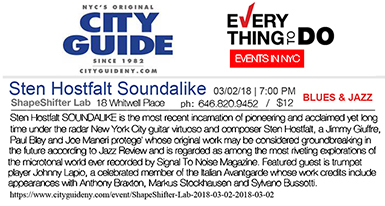 On another indeed related note, here is a feature in Italian magazine JAZZIT on my friend, recent collaborator and simply extraordinary trumpet player Johnny Lapio, who came to New York City in March, to perform and record with me. He talks about his international work in general as well as our work specifically. Look for our duo album to be released on the Sonus Rex label this fall. This article is all in italian, so google translate is an option for those of us not fluent. Here is the link plus the excerpt where he talks about our duo work and project.
" 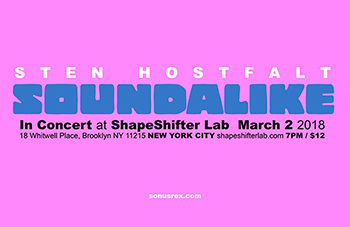 New York mi ha visto invece prima in duo il chitarrista Sten Hostfalt col il quale, oltre a registrare un disco, ho tenuto una serie di concert in lioghi come lo ShapeShifter Lab di M.Garrison è poi con l'organista Constance Cooper nel Queens. L'atmosfera concertista e stata surreale poiché nei miei giorni di permanenza mi sono imbattuto in un tempo veramente grigio e nevoso, il vapore dei tombini avvolgeva le persone e in due occasioni nelle chiese in cui ho suonato era percepibile chiaramente il passaggio della metrapolitana il cui suono è stato inglobato in manera assolutamente naturale nell'atmosfera del concerto insieme ai colori dei rosoni. 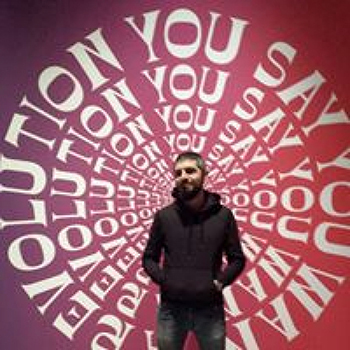 Anche in questo caso, in particolare con Sten, c’è stata un’ottima intesa e ho avuto modo di confrontarmi anche con la sua musica microtonale, fortemente innovativa." 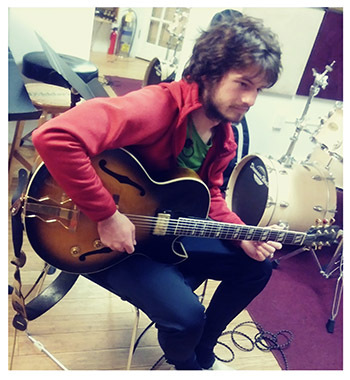 Exciting season ahead, as we first of all thank and send our longtime friend talented young Jazz guitarist and vocalist (and drummer as well) Henry Hunt off to college studies at The University of Chicago, where he will be a part of the University's Jazz ensemble. 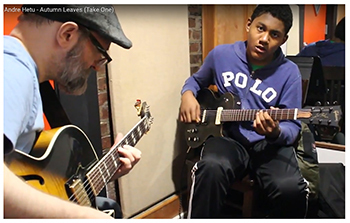 Via the New York Jazz Academy network, Henry has been an incredibly steady regular at the studio ever since spring 2013, which makes him one of the most consistently attending regular students at this operation ever. During his 5.5 years of regular, weekly private studies at the studio, in conjunction with high school ensemble studies as well as occasionally also in the Summer Jazz Intensives at New York Jazz Academy, Henry's active participation has been invaluable in inspiring and ultimately contributing to shaping the curriculum at hand and in use as we speak. and wish him luck on his further adventures musically and otherwise. For many of us, the summer season presents that unique time and scenario for getting into some real playing and learning about music. Things that can not be easily done in regular weekly sessions can then be laid out as somewhat longer workshop type of sessions. Learning tunes. Improvisation. Working on rhythm and time. Ear training and Transcription. Recording. Composing. Music Theory and notational skills. These are just some of the many things that students tend to want to focus on in extended double or triple sessions, that may be suitably laid out during the summer season. Again it is worth noting that what students sign up for and subscribe to is not the immediate surface aspect or general assumption of what the educator in question may appear to typically publically represent as a performer and recording artist, academic alumnus or member of the musician and artist community. But rather the cumulative experience he or she have earned and come to represent over time, since this is what translates to actual knowledge suited for guidance and advice. The July schedule is posted here. Take a look at the general availability and once you find a date, day and time that works for you, just hit me up and we will go right ahead and schedule it accordingly. All dates are first come first serve so please schedule at least a full week and ideally even further ahead of time. Short notice requests will not work, as lesson planning requires knowing about all of the overall work and related travels and commitments at least a week in advance. Thank You and hope you are enjoying your summer so far ! York City. Way to go Andre' ! Do Keep us in the loop, always. 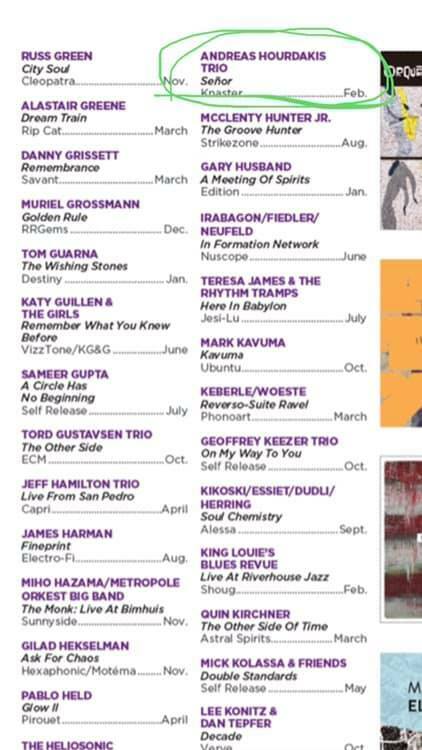 and since has become as member of ex EST drummer Magnus Ostroms band with whom he has toured the world and appeared on recordings alongside 20 times grammy award winning Jazz guitarist Pat Metheny. Lately Andreas own recordings as a leader has picked up momentum. Most recently his second album as a leader was featured in a 4-star review in the worlds leading Jazz publication Down Beat Magazine. well as de-oxide spraying the electrical components. typically played on the guitar) TONE and SOUND. constant structure and used intervals over pedal point. tones to derive ( more mobile ) 3-part voicings. formats such as 12-bar Jazz Blues and Rhythm Changes. plus diatonic ( within the scale of the moment ) triads. response and sound and silence. Substitute - Harmonic Properties and Implications. see as a mI7b5, "a mi6 chord with the 6 in the bass". major - relative minor and in major - relative minor. referred to when creating substitute progressions. there are a number of available possibilities. progression ( cyclical or stepwise ). Speaking of fundamental structures, a humble reminder that there is an underlying format making all of our successes possible. A context that is defended at all cost. Those who know me well also know that I was introduced on the creative music scene of the late 70's-early 80's, when political consciousness was norm and how this has shaped me. While I over my 40 years as a musician, composer, arranger, educator, producer, calligraphist and music professional have had the great fortune to be engaged by and work for many amazing employers and participated in countless projects with outstanding work conditions, offering creative-artistic opportunities most only dare to dream of. I also know that beneficial, nurturing, productive and 'good' working conditions and circumstances, or fair ones for that matter, in no way are guaranteed to us, but typically have to be strived and fought for. 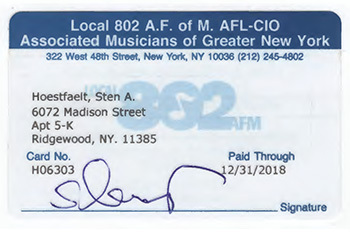 My membership in and affiliation with the American Federations of Musicians local 802, Associated Musicians of Greater New York-the world's largest local union of professional musicians, and therefore the contractual guidelines provided accordingly, attests to my continuous quest and claim for decent and fair professional conditions always. Regardless of physical location, format and wrapping, the creative music work we do every day, year after year is built on mutual respect for and understanding of the cultural traditions that generated it all, and the people so honorably upholding and representing them to nurture and make our collective creative path possible. Any session organized via Stens Guitar Studio subscribe to these standards and adopt a conduct accordingly. Aggressive, demanding or demeaning requests will never be accepted here. Thank You all for participating in building an activity where respect and creative exchange is key. * In addition to membership in AMF American Federation of Musicians and BMI Broadcast Music Inc, I also do follow and support the social debate, commentary and music industry and work climate scrutiny of organizations Content Creators Coalition ( with among others Marc Ribot, Rosanne Cash as board members ), Justice For Jazz and Jazz Foundation of America. 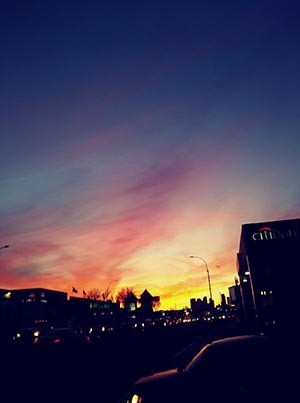 The forums where the people who create, make, teach and communicate music discuss and help improve the conditions according to which it is to be created and presented. full speed despite the increased work load. follow before a possible release will be determined. a sole proprietor registered New York City business. of time usually makes sense. SEE YOU IN SESSION ! Bussotti, Markus Stockhausen and Anthony Braxton. very own prefered setup and location here. place specific requests for music to study. study topics / project focus suggestions. the piano provides an unrivaled overview. Tuplet Trainer provides a great study resource. be the world's most competetive music scene. on actual street-level credentials and reputation. Without the students - no activity ! Simple as that. Thanks again and SEE YOU IN SESSION ! do we actually operate ON the staff of the treble clef. and an instrument that gets played a lot will always sound good '. they know about purely melodic or rhythmic playing. ( once again ) already operate in the bass register. Awareness of this is what makes all the difference. chord progressions and music, really does not. versatile instrument - as well as of music in general. NOVEMBER-DECEMBER + year 2018 SESSIONS scheduled now. Get in touch to claim a weekday and time, or specific dates by signing up for monthly (3-lesson pack), quarterly (8-lesson pack) or seasonal (12-lesson pack) setups ... SEE YOU IN SESSION ! WELCOME TO THE WORLD OCEAN ! 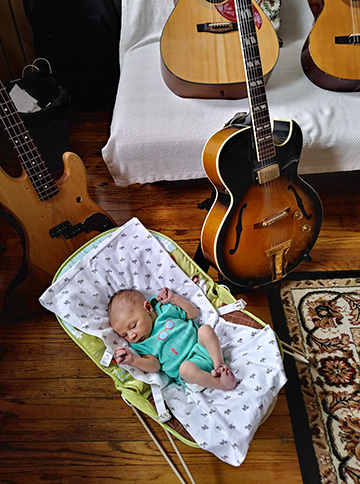 Hanging out in the Ridgewood studio on Sunday afternoon, born 09.28.17 in Brooklyn New York and a little more than a week old, Ocean Theodorou Hostfalt is the youngest ever member of the guitar club and we can't wait to introduce him to everyone and to all of the music going on here. mode right now with True Polyphonic thinking. prove to be beneficial and a true advantage. new ways to access, use and work with them. enjoy reinforcing, continuing and passing on. taken when approaching the instrument. We are excited to see where this takes us. on project basis, as often as you like. according to available session times. quick, easy reference on the info page. Microtonal Guitar Works Vol.1 OUT NOW ! Guitar Live at Knitting Factory New York. eight or twelve lesson package. the creative input this summer ! Associated Musicians of Greater New York.